So today being the 4/4/14 is my son's 4th Birthday. We didn't have a party but we did do a cake for him to share with his friends at daycare. 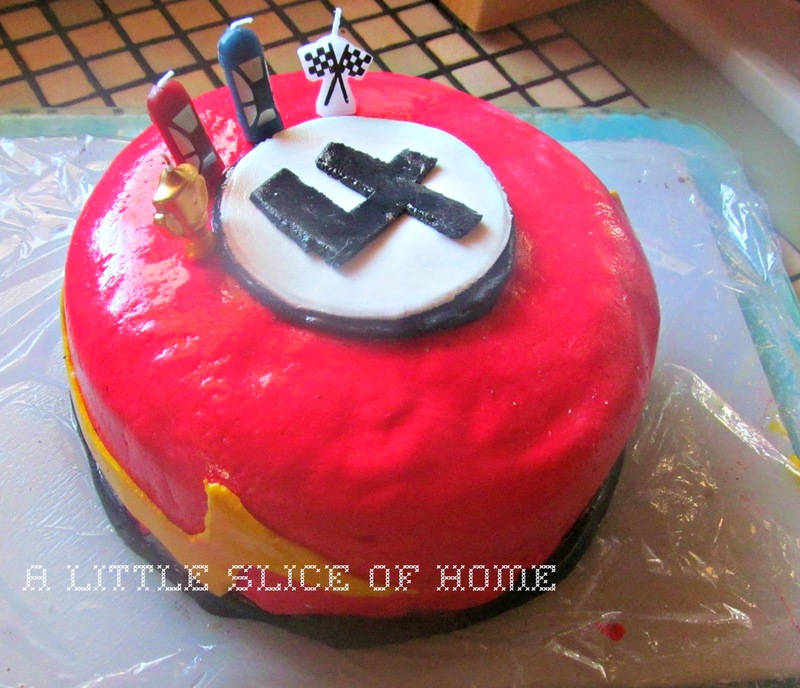 Lightning Mcqueen themed. I really hope you picked up on that with the Piston Cup, Lightning Mcqueen, Sally and Racing Flag Candles on the top. It's far from perfect. It was my first time working with fondant and all I had were basic kitchen tools. I used a paring knife to cut the fondant, a spatula to smooth the fondant and a cup to cut the circles. Far from a master chef but hey it worked and that's the main thing. The cake was a double mixture of this simple vanilla cake http://allrecipes.com.au/recipe/4679/simple-vanilla-cake.aspx and the fondant I made with this easy recipe http://www.wilton.com/recipe/Rolled-Marshmallow-Fondant. I coloured the fondant with food colouring. I couldn't find gel colouring at the supermarket so had to make do with liquid. I had both Queen and Hansells brand food colouring and found that the Queen colouring gave a much darker colour than the Hansells. I thought I was going to end up with pink icing for awhile until I decided to try the Queen colouring and managed to get it to turn red. Oh and a quick tip, when dyeing the fondant make sure to wear gloves or if you have a kneading attachment on your blender I suggest you try that. My hands were pretty colourful for awhile and you want to be careful, especially with the white that you don't bleed the colours into each other.